Be sure to talk with your primary health care provider and ask is L glutamine safe for you to take or not. Each person has an individual medical history which should be taken into consideration before taking any supplement. L glutamine, which is also known as glutamine, is the amino acid most prevalent in the human body. This amino acid plays significant roles in muscle metabolism and in the gastrointestinal tract. Due to this, L glutamine is often used as a treatment for ulcers and disorders of the small and large intestine, because it nourishes tissue within the small intestine which improves nutritional absorption. Many people take L glutamine to bolster their immune system. This supplement increases the body's ability to make white blood cells and in turn helps to fight infections and pathogenic micro organisms that can make you sick. Even if you don't have these health conditions, before you take L glutamine make sure you talk to your doctor about any other medications you are taking. This includes both prescription and over the counter remedies as well as other supplements and vitamins you take. Some of the other health related concerns associated with L glutamine are linked to the safety concerns listed above. For example, taking L glutamine supplements may worsen some conditions such as hepatic encephalopathy. This is a brain condition that occurs because of high ammonia levels brought about as the result of liver disease, and because L glutamine breaks down into ammonia within the body, it is not a supplement to be taken by individuals with this condition. If you are prone to seizures the same kinds of precautions should be taken because taking L glutamine supplements may increase your risk of seizures. Allergic reactions should also be taken into consideration. If you are allergic to MSG (monosodium glutamate) there is a higher risk that you will also be allergic to L glutamine. The following is not a comprehensive list of how every drug interacts with L glutamine, but provides a glimpse of why it is important to talk to your doctor before taking this supplement. For those considering taking L glutamine to improve their immune system while undergoing chemotherapy, think again. Some experts are concerned that L-glutamine might actually encourage tumor growth. Not only that, but there is also some concern that it may also affect how your body responds to the chemotherapy medications, though this has not been backed up scientifically at this point. Glutamate is an excitatory brain chemical. 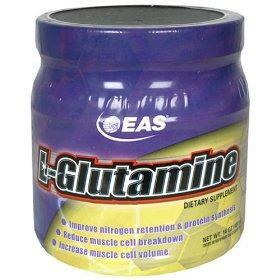 When taking L glutamine, the body can metabolize it into glutamate. As a result it can make various seizure medications less effective. Lactulose is most often prescribed as a laxative, but it is also used to help prevent high ammonia levels in people who have liver disease. Remember that L glutamine breaks down into ammonia within the body, and because of this it can hinder the effectiveness in using lactulose for the treatment of high ammonia. Talk to your doctor about the potential side effects of glutamine, and note that it is possible that the prescription or over the counter product you take wasn't discussed in this article. That does not guarantee that it is safe for you to take L glutamine. Take the time to talk with your pharmacist when buying products, and be sure to let your doctor know about every supplement, medication and other over the counter products you take when asking for his advice. The only way your doctor can give you an informed answer is when you equip him with the information he needs to know.